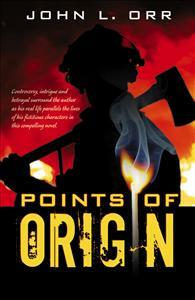 Controversy, intrigue and betrayal surround the author, John L. Orr and his uncut manuscript Points of Origin. Haunting questions continue to surround the parallels between Orr’s real life and the lives of his fictitious characters in this compelling novel. Join the investigation as lead character, Arson Investigator Phil Langtry, searches every clue to uncover a serial arsonist. Could it possibly be ‘one of their own’? This scintillating story was confiscated from the author’s home at the time of his arrest. Many believe it parallels his own activities while working as the fire captain and lead arson investigator for the Glendale Fire Department, California. He is currently serving a life sentence at Calipatria State Prison, California. This uncut story continues to be a source of ongoing controversy as recently witnessed on Investigative Reports, Nova and Arrest & Trial.